I had won this ebook of Tommy O’Tom in a Tub O’Trouble. Through the Goodreads giveaway. I won like to thank author J.T.K Belle, for this book. My niece and the younger children enjoyed this book. I thought this was a cute little book for children 7 and younger. This was definitely funny and will have the children laughing not only the children but adults too. 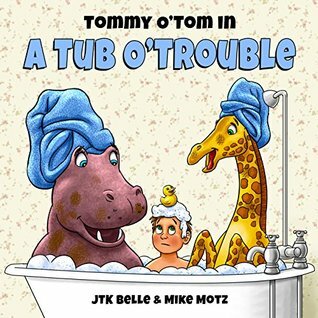 In this charming bedtime read-aloud, written by JTK Belle in a laugh-out-loud, rhythmic text, and beautifully-illustrated by Mike Motz, a bathtub full of mischievous zoo animals does their best to thwart Tommy O’Tom’s bedtime preparations, and leave him to explain a bathroom mess to his puzzled mother. Recommended for ages 2-5.